Why haven't I seen this product before? The Googolboard is a kid's keyboard, with colorful, over-sized keys. It's a pretty simple idea with a beautiful execution. I spoke with the inventor, who explained to me that the keys are mechanical (non-membrane) and very durable. 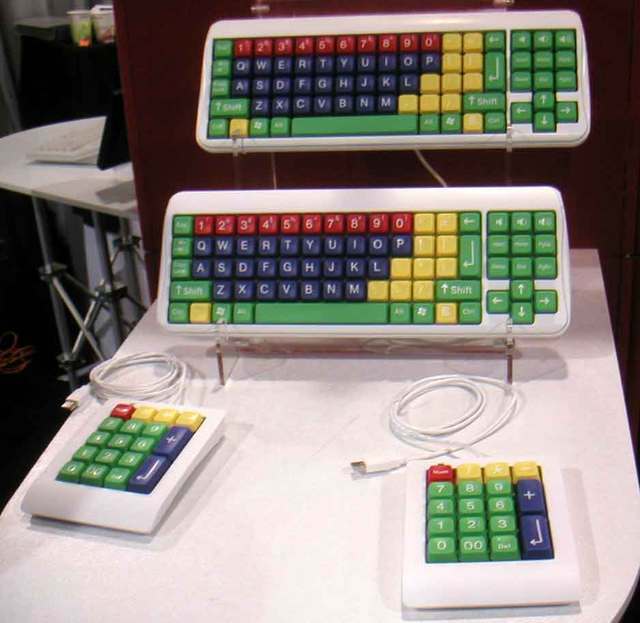 They remind me of those IBM keyboards back in the day that clicked with every keystroke. The problem with it is the price-point - $69 for the keyboard and another $49 if you want the numeric keypad (this was what they quoted me - their web site lists it at a whopping $99). The price is so high I can't imagine anyone actually getting one (they priced me out of getting one). At $20 or $25 I think they'd sell a lot, but I suppose the marketplace will be the one to sort this out.